Highways are shifting to more and more DDIs and a well-designed DDI has the potential to improve safety, reduce traffic delays, and save costs over traditional interchanges. Designers are faced with the challenge of balancing competing factors, such as the footprint and geometry, safety, design vehicle accommodation and cost. NEXUS DDI reduces the need for manual generation and editing of DDI geometry. Be more productive using parametric drafting and dynamic design modeling. 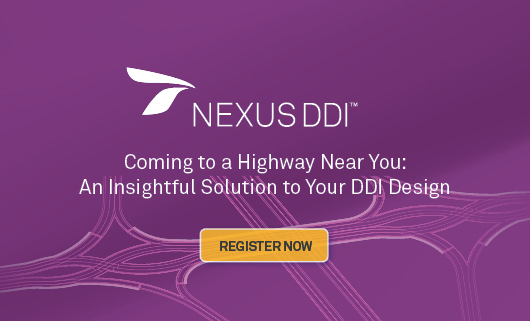 By using NEXUS DDI, even the less experienced designers will gain confidence and knowledge in designing more complex DDIs. We would like to invite you to our webinar to navigate the DDI design concept and geometric design solution.